Natural Wood in small format which has the minimum thickness of all the parquet flooring ranges of L’Antic Colonial. This feature makes for an attractive and competitive range in each of its products. Simplicity with a 3-mm hardwood wear layer and HDF body that make up a board with a small but elegant size (14.5x120x1.4 cm). The line has a great balance among its colors. Therefore, Tortona is perfect for any room. Sapwood is the lightest part of the wood, the one that occupies the outer ring of the log and is the last to form. The combination between old and new brings light and contrast to any surface. A walnut hardwood floor is durable, stable and easy to lay. Its color varies with the wood's origin, reddish brown for American walnut, grayish brown for European species. Both have dark veins. It has a uniform, non-porous surface that resists mold. 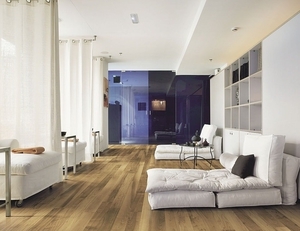 Walnut is used in both solid and laminate wood floor construction. Walnut floors are suitable for any interior space except bathrooms: living rooms, halls, bedrooms, dining rooms, kitchens, etc. Choice will depend on the specific aesthetic characteristics of walnut and the desired decor of the room. Board thickness must be suitable for the room type and expected traffic. It should be remembered that walnut is relatively expensive.